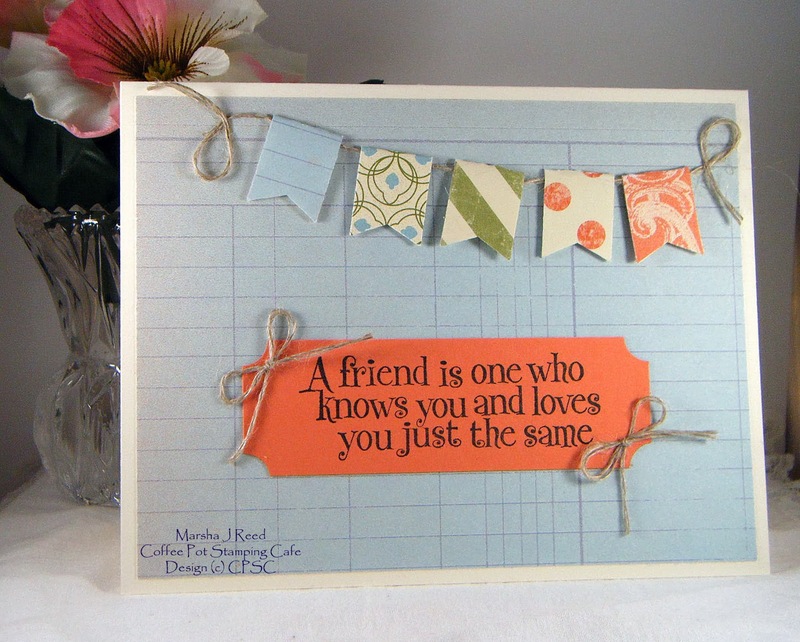 Can I just say I love that little Banner Punch from Stampin' Up!® It made creating the banner for my card so easy. You can get it free and love it, too! With every $50 you spend, during Sale-A-Bration, you get a free gift. Now how cool is that! You can click on the Stampin' Up!® Catalogs tag to find the Sale-A-Bration Catalog. Now on to the card I made for a very sweet friend. She was there for me after my mother passed away and I have treasured her friendship every day since. Through the good, the bad and the ugly, she was there to love and encourage me. I am so thankful to be blessed with such a friend. For the banners I folded a strip of paper and punched out the banner just before the fold so I had a double layer banner instead of a single layer. While it doesn't show well in the photo, the banner is not attached to the top of the card except at the ends where the Linen Thread is attached. I guess you could call it a fluttering banner. Now I'm off to get my hands really dirty! I've been taking a series of stenciling classes. I have learned a lot about what you can do with a stencil. Julie is a very good teacher and so cute. Yesterday she wore ears during the broadcast. Too funny! If you are interested, go check out her blog HERE. Time to Give it Up!